For publications by Biblia Arabica researchers, please see Project Leaders and Research Associates, as well as Intellectual History of the Islamicate World 1 (2013). For general publications about the Bible in Arabic, see the Bibliography of the Arabic Bible: A Classified and Annotated History of Scholarship. 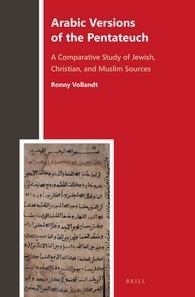 This series published by Brill, publishes critical (including synoptic) editions of Arabic versions of individual biblical books produced in the Middle Ages and beyond, as well as studies that examine the different schools and persons that took part in this scriptural translation enterprise, analyzing their aims and methodologies, as well as the social and cultural implications of their endeavor. In addition, the reception of and reactions to these translations by Muslim authors fall within the scope of the series. 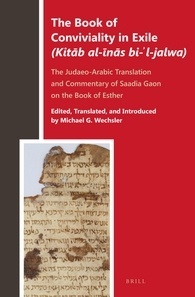 This volume presents a critical edition of the Judaeo-Arabic translation and commentary on the book of Esther by Saadia Gaon (882–942). This edition, accompanied by an introduction and extensively annotated English translation, affords access to the first-known personalized, rationalistic Jewish commentary on this biblical book. Saadia innovatively organizes the biblical narrative—and his commentary thereon—according to seven “guidelines” that provide a practical blueprint by which Israel can live as an abased people under Gentile dominion. Saadia’s prodigious acumen and sense of communal solicitude find vivid expression throughout his commentary in his carefully-defined structural and linguistic analyses, his elucidative references to a broad range of contemporary socio-religious and vocational realia, his anti-Karaite polemics, and his attention to various issues, both psychological and practical, attending Jewish-Gentile conviviality in a 10th-century Islamicate milieu. See review in RBL 2016/9. 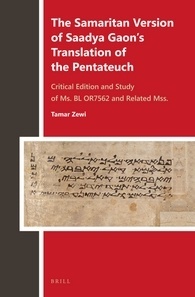 This work offers a seminal research into Arabic translations of the Pentateuch. It is no exaggeration to speak of this field as a terra incognita. Biblical versions in Arabic were produced over many centuries, on the basis of a wide range of source languages (Hebrew, Syriac, Greek, or Coptic), and in varying contexts. The textual evidence for this study is exclusively based on a corpus of about 150 manuscripts, containing the Pentateuch in Arabic or parts thereof. See review in RBL 2017/7. This edition of MS London BL OR7562 and other related MSS, and the accompanying linguistic and philological study, discuss a Samaritan adaptation of Saadya’s Judeo-Arabic translation of the Pentateuch, its main characteristics and place among other early Medieval Arabic Bible translations, viz., other versions of Saadya’s translation of the Pentateuch, other Samaritan Arabic versions of the Pentateuch, and Christian and Karaite Arabic Bible translations. The study analyses the various components of this version, its transmission, its language, the extent to which the Samaritans adapted this version of Saadya’s translation to their own version of the Hebrew Pentateuch, and their possible motives in choosing it for their own use. In Christian Arabic Versions of Daniel, Miriam L. Hjälm provides an insight into the Arabic transmission of the biblical Book of Daniel. This book offers an inventory and a classification of extant manuscripts as well as a detailed account of the translation techniques employed in the early manuscripts. The use of the texts is discussed and the various versions are compared with liturgical Bible material. Miriam L. Hjälm shows the importance of Arabic as a tool for understanding the development of the religious heritage of Christian communities under Muslim rule. Arabic became an indispensable part of the everyday life of many Near Eastern Christians and was increasingly used next to the established liturgical languages, which remained the standard measure of the biblical text. Senses of Scripture, Treasures of Tradition offers recent findings on the reception, translation and use of the Bible in Arabic among Jews, Samaritans, Christians and Muslims from the early Islamic era to the present day. 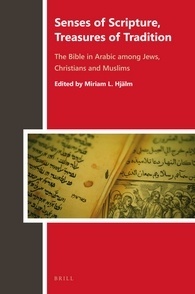 In this volume, edited by Miriam L. Hjälm, scholars from different fields have joined forces to illuminate various aspects of the Bible in Arabic: it depicts the characteristics of this abundant and diverse textual heritage, describes how the biblical message was made relevant for communities in the Near East and makes hitherto unpublished Arabic texts available. 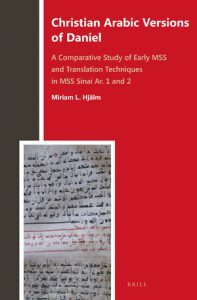 It also shows how various communities interacted in their choice of shared terminology and topics, and how Arabic Bible translations moved from one religious community to another. 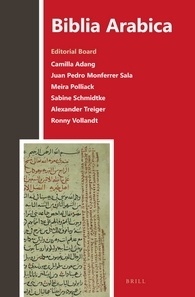 Contributors include: Amir Ashur, Mats Eskhult, Nathan Gibson, Dennis Halft, Miriam L. Hjälm, Cornelia Horn, Naḥem Ilan, Rana H. Issa, Geoffrey K. Martin, Roy Michael McCoy III, Juan Pedro Monferrer-Sala, Meirav Nadler-Akirav, Sivan Nir, Meira Polliack, Arik Sadan, Ilana Sasson, David Sklare, Peter Tarras, Alexander Treiger, Frank Weigelt, Vevian Zaki, Marzena Zawanowska.